Many people will know that Draper as a brand make good quality tools at affordable prices. It is no big surprise therefore to find them in the gardening market. We have these garden shears at number two in our top 10 list of garden shears, just behind the Spear and Jackson model. Buyers rate these shears highly. They have rated them at a high 82% satisfaction rating, and that really does say a lot. They certainly look good, so let's take a closer look at the buyer's thoughts and views. If you are looking for something in the cheaper price range, then these Draper shears are priced at around £14-17. The final price that you pay will of course depend on where you make your actual purchase. At this lower price range, I think they offer good value for money. The normal RRP is £22-23. At the lower price point, these will be affordable for most people. It is also worth mentioning that Draper tools are becoming more and more popular in the UK. They are good quality and they do try to keep their prices low. That makes them attractive to many homeowners, who want good quality but don't want to break the bank to get a decent type of product. These hand shears fit nicely into this bracket. It is always important that before buying a product to have a look at what real life buyers of the product have to say about it, and also how they rate it. That is what we do here at the website, and then we try and summarise that information so as our readers don't have to read through countless buyer reviews. Overall buyers have given these Draper shears an average buyer satisfaction rating of 82%. Buyers rate these highly enough and overall and give them good reviews. In my opinion they are a little more expensive than they should be. Buyers however say that these are good value for money. If these are not the right shears for you, then click here to see my top 10 rated list of hand shears. The good news about these is that there almost no bad reviews about this set of shears and that is always a very good sign indeed. That is in our opinion directly related to the lower price point. Many garden shears of high quality cost around £30. With these selling at around half that price, buyers are a tad more forgiving in being too critical about these. These will do the job for any gardener who needs to cut the edge of a lawn, or trim a hedge or shrubs. They don't have any of the fancy gearing mechanisms, so a bit more manual to use than that type. 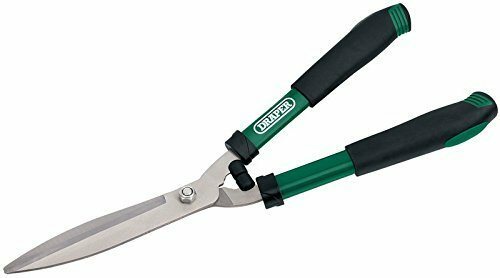 These are in our opinion a good basic set of shears and will be fine if they are only used a few times a year for lighter types of cutting.